In the last few weeks I was participating in the first session of "Hackita", which means "The classroom" in Hebrew. This project aims to bring people from different backgrounds to learn and develop open source web applications together. Furthermore, the project is part of The Public Knowledge Workshop, and as such one of its main goals is to guide its participants to complete a project that expose public knowledge to the public by the end of the 2 month session, somewhere around late January. Until now we've learned few technologies that will help us accomplish this goal and from the next week we will start to work on the final project. SimpleCrypt - Online cryptographic tool, based on DES. Source @ github. 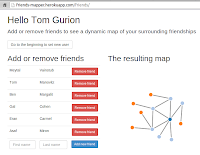 Friends-Mapper - Creates a dynamic map of your friends. Source @ github.